I had been volunteering for Alzheimer’s Society – working on Dementia Action Alliance’s website – for a while, when a new volunteering position with Dementia Friends came up. This was an initiative I had heard about and after talking with the Marketing Manager I realised what important work Dementia Friends does and I wanted to be part of it! My involvement began when I started with the team as the Marketing and Communications volunteer. I attended Dementia Friends Champions training and was highly motivated to run Information Sessions. It was a while before I ran my first Session, and that was just for family to practice my presentation skills! The Session went well and we all ended up talking about Dementia Friends and dementia for about two hours and I was given great (maybe somewhat biased) feedback by my family on my presentation skills. I have gone on to run more Sessions (see picture to the left) and I find I thoroughly enjoy talking to people about a topic that I think is very important, and it will affect all of us at some point. 40% of people living with dementia have reported feeling lonely, so by making our communities more dementia friendly, hopefully we can lower these numbers and help people to live longer in their own homes. My work in the office has been around communicating with the many supporters of Dementia Friends. Whether that’s through our newsletters (if you’re not subscribed, sign up on our website now for great updates about Dementia Friends! ), Facebook, Twitter or this wonderful blog. 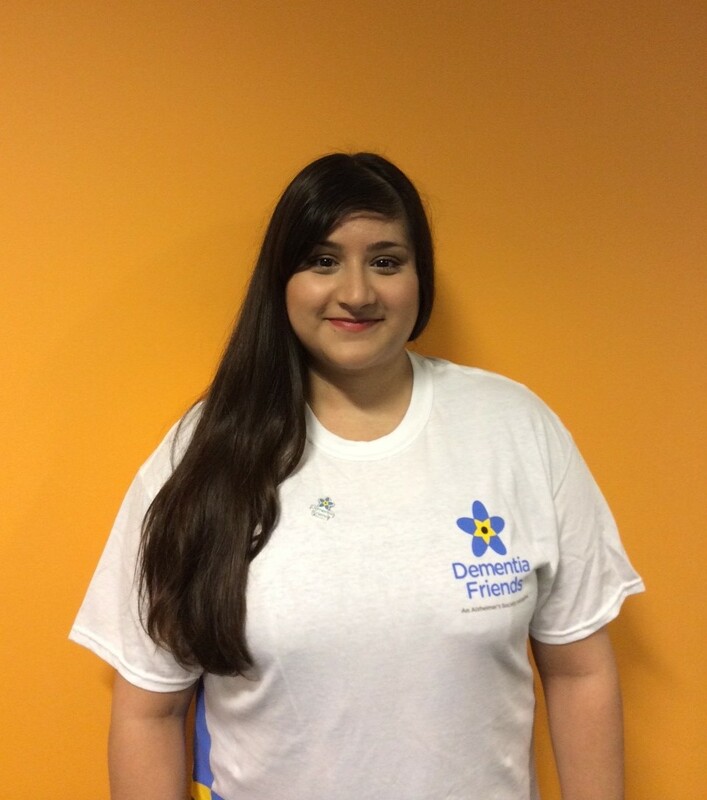 Lots of exciting things have been happening in the world of Dementia Friends lately, one of the most recent is the launch of brand new t-shirts, mugs and tote bags. I’ve had the privilege of being involved with the launch of these products and every time I leave the house, I find myself scanning the crowd to spot one of our t-shirts or bags! Dementia Friends is about raising awareness about dementia. The part that I think is great is that you don’t have to be a healthcare professional, or even have a personal experience of dementia to understand the message and the knowledge imparted to you in one of the Dementia Friends Information Sessions. It’s about reaching as many people as possible, so they know a little bit more about the condition and small things that anyone can do to help people affected by dementia. Like I said earlier, at some point in all our lives we will most likely be directly or indirectly affected by dementia, and knowing about it can remove some of the stigma and fear that often accompanies the word ‘dementia’. So visit our website, get involved and spread the word about this important cause. This entry was posted in Why A Champion on October 17, 2014 by Dementia Friends. Hi Sophie, I’m very sorry to hear you are experiencing problems on the website. I would first advise you to try the website on a different web browser/device. Failing that, please contact our customer care team on 0300 123 1016 and they will be able to investigate this for you.